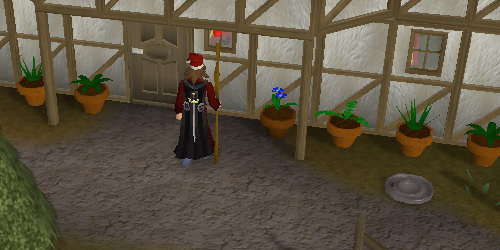 The town of Taverley, commonly misspelled "Taverly," is home to the Druids of RuneScape. 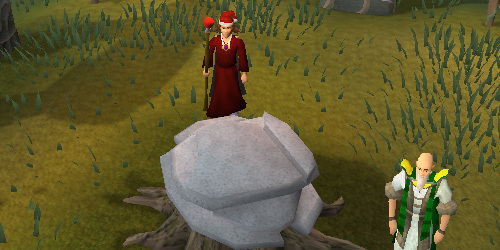 Druids are followers of Guthix, God of Balance, and choose to live close to nature. 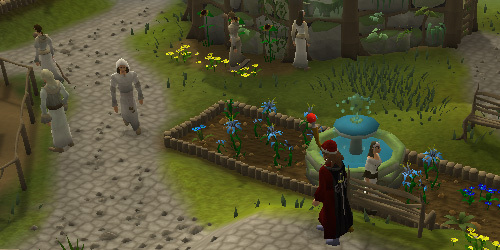 The city is located northwest of Falador, just beyond the Members-only gate, and is a common first-stop for players who have upgraded to Members for the first time. 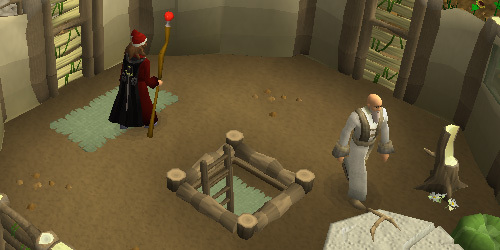 It is the start point for several quests, as well as the Herblore skill, and the Taverley Dungeon is also a popular training area for players. 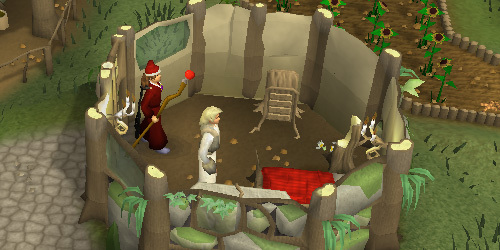 Taverley is located northwest of Falador, directly south of Burthorpe, and just east of Catherby. There are several ways to reach the city, although most methods will require some walking. Travel to Falador using your preferred method, including Falador Teleport, Explorer's Ring 3, Games Necklace, or Skills Necklace. 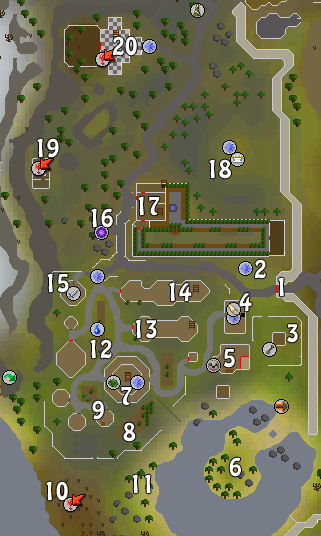 Then simply follow the northern road from Falador until you reach the entrance gate. There is also an Agility Shortcut on the west wall of the city which requires level 5 Agility to use. Then simply walk north until you reach Taverley. Travel to Burthorpe using a method such as a Games Necklace teleport to the Burthorpe Games Room, or a Combat Bracelet teleport to the Warriors' Guild. Then just travel south until you reach Taverley. Travel to Catherby using your preferred transportation method, including Catherby Teleport, Camelot Teleport, or Charter Ships. From there, you have several options. First, you can travel over White Wolf Mountain located between Catherby and Taverley. However, this method can be dangerous for lower-level players as there are numerous Wolves roaming the mountains, ranging from level 25 to level 73. If you have completed the Fishing Contest quest, you may use the Dwarven Tunnel entrance located just north of Catherby, near the mountains. This tunnel travels directly under White Wolf Mountain, and is much safer (and quicker) than travelling over the mountain itself. The tunnel exit is located directly north of Taverley. 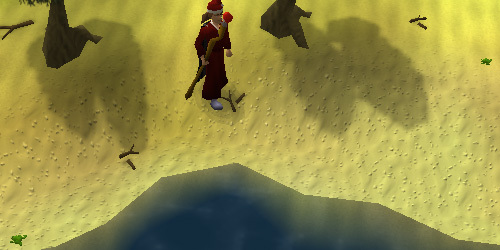 If you have level 32 Agility, 35 Strength and 35 Ranged, and have completed the Fishing Contest quest, you can use a Mith Grapple on the far-east cliff near the Fruit Tree Patch. This shortcut brings you just west of Taverley. 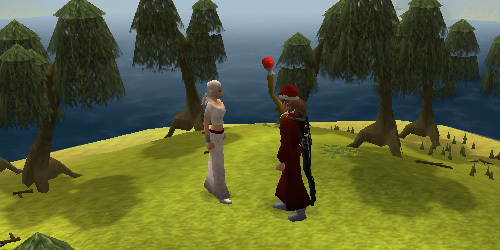 Players who have completed the Enlightened Journey quest can use the Hot Air Balloon transportation system to travel directly to Taverley, just south of the Wood Tree Patch. 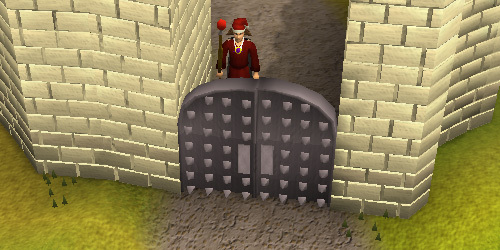 The entrance gate essentially separates the Freeplay world from the western Members-only world. 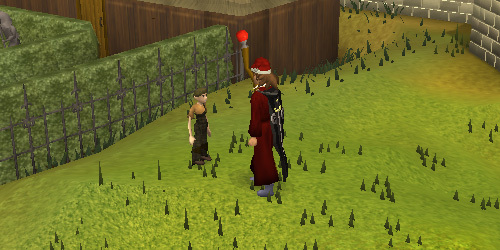 Once you walk through the gate, you should practically smell the Guthix-y goodness of the area! Welcome to Taverley! The Boy, located northwest of the entrance gate, is the starting point for the Witch's House quest. He seems to have lost his ball in the Witch's yard, and she placed it in her shed instead of returning it to him. South of the entrance gate is a Farming Patch for growing wood trees. Alain will watch over any trees you plant in this patch, for a fee. 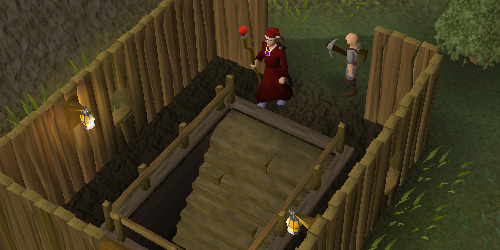 There is also a Tool Leprechaun wandering around the patch who will hold your Farming tools and exchange your harvested crops for Bank Notes. The Summoning Shop can be found south of the Boy, and it is run by Pikkupstix. Players can start the Wolf Whistle quest by speaking to him, which is required to use the Summoning Skill, and to access the Summoning store. One notable item sold here is the Summoning Cape of Achievement, which requires level 99 Summoning to buy. 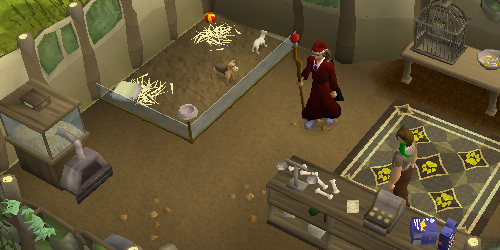 The Pet Shop is located south of the Summoning Shop. The Pet Shop Owner stocks food for pets, and the Incubator is used to hatch eggs. 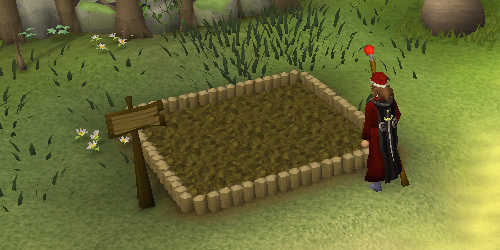 Just outside the Pet Shop is an Earth Mound, which is used in the Grim Tales quest to grow a Magic Beanstalk. A short distance southwest of the Pet Shop is Tegid, who is busy washing his clothes in the lake. He plays a role in both the Eadgar's Ruse and Mourning's Ends Part I quests. The Lady of the Lake is involved in the Merlin's Crystal quest, and she is located on the peninsula in the center of the lake south of the town. She gives you the Excalibur sword during the quest, and she will also give you a new Excalibur if you happen to lose yours, for the price of 500gp. 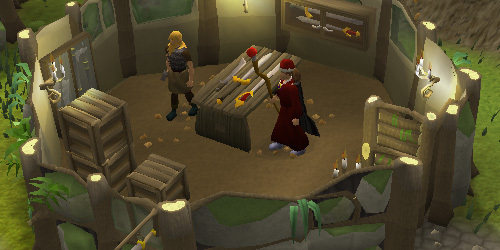 Jatix runs the Herblore Shop, which is located west of the Pet Shop. He sells Vials and Eyes of Newts, in both single quantities and packs of 50. Upstairs you will find Sanfew, who is involved in several quests, including Druidic Ritual, Eadgar's Ruse, and One Small Favour. 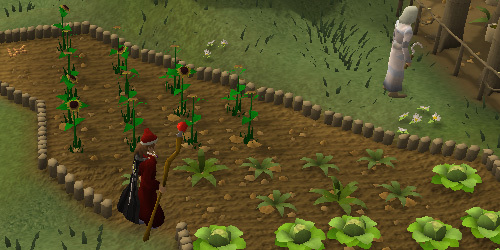 The Cabbage garden is found just south of the Herblore supply shop, and contains several Cabbages which can be picked. There is also a King Worm respawn in the southwest corner of the patch. 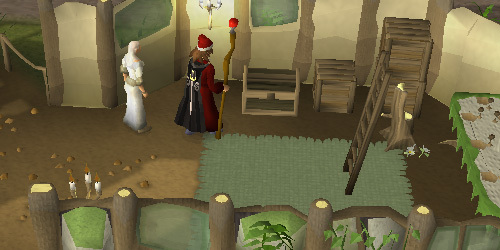 The drawers in the small house west of the Cabbage Patch can be searched to solve a Clue Scroll. Just outside the small houses in the southern part of town are several picnic tables and a single Cup of Tea respawn. The entrance to the Taverley Dungeon is located south of the town. It's a rather large dungeon, and is home to a great variety of monsters, including Skeletons, Hellhounds, Hill Giants, Blue and Black Dragons, and Lesser Demons. The dungeon is also involved in a number of quests, including Druidic Ritual, Scorpion Catcher, Heroes' Quest, Wanted!, and The Void Stares Back. South of Tegid, along the western coast of the lake, are three Swamp Toad respawns. Swamp Toads are a common ingredient in Gnome Cuisine. 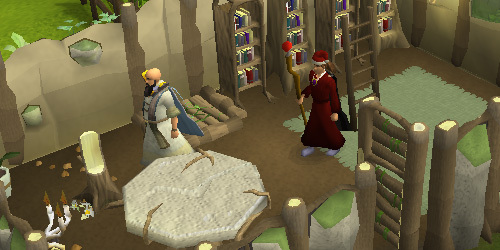 North of the Herblore Shop are quite a few Druids and Druidesses wandering around. 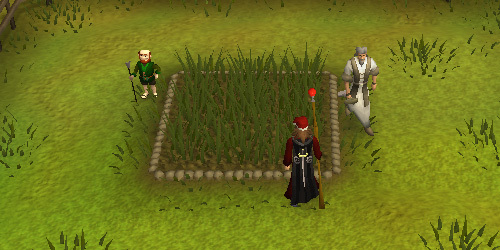 This area is a great place to train and collect Herblore ingredients. Slightly south of the two-handed sword shop is Bettamax, who is a Botanist-in-training. 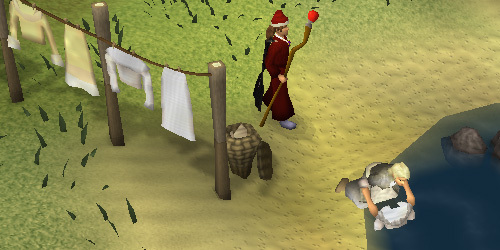 She sells Juju Teleport Spiritbags which will teleport you to the Herblore Habitat Activity. 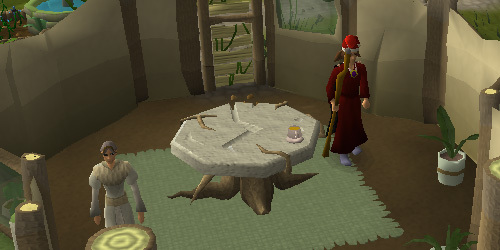 The large house north of the Herblore Shop contains a Cup of Tea respawn on the table near the door. There is also a single Shortbow respawn on the floor upstairs. The house north of the Tea respawn house contains the world-renownd Crystal Chest. To open it, you must combine the Loop Half of a Key and Tooth Half of a Key to create a Crystal Key. The Crystal Chest always contains an Uncut Dragonstone, and may also contain other random items such as Rune Bars, Coins, assorted Runes, or a Spinach Roll. Ivy Sophista can also be found wandering around the chest, who is involved in the While Guthix Sleeps quest. Upstairs you will find Thaerisk Cemphier, the leader of Crux Eqal. Like Ivy Sophista, he is involved in the While Guthix Sleeps quest. Gaius owns and operates the two-handed sword shop which is called "Gaius' Two Handed Shop." He sells all types of two-handed swords up to Adamant. 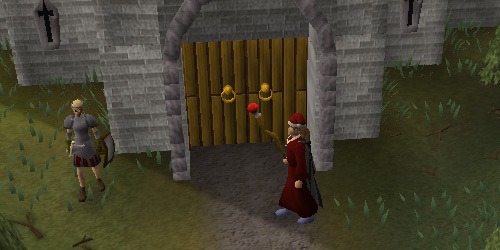 Just north of the two-handed sword shop is the House Portal, which allows access to Player Owned Houses located in Taverley. Across the street from the House Portal is Nora T. Hagg's house, which is uses in both the Witch's House and Grim Tales quests. 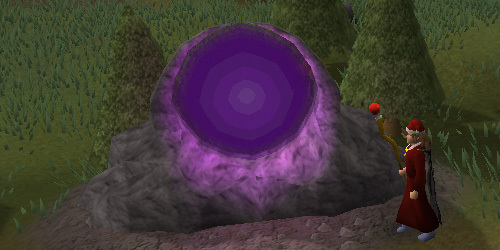 North of the Witch's House is the Altar of Guthix, which can be prayed at to restore your Prayer when necessary. You will also find Kaqemeex wandering around the area, who will allow you to begin the Druidic Ritual quest by speaking to him. 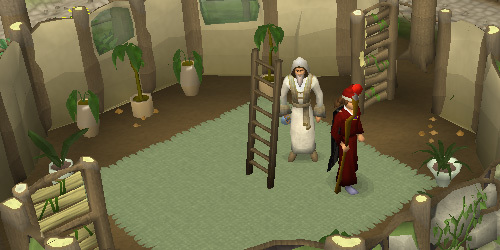 If you have achieved level 99 in Herblore, you may also buy an Herblore Cape of Achievement from him for 99,000gp. 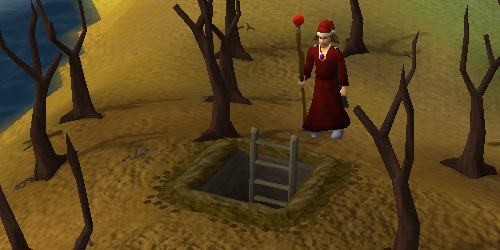 The entrance to the Dwarven Tunnel is located to the west of the Altar of Guthix. This tunnel travels directly beneath White Wolf Mountain, and is a much safer route between Taverley and Catherby. However, until you complete the Fishing Contest quest, you will not be allowed to use this passageway. To begin the quest, you can speak to Austri, who is guarding the entrance to the tunnel. Following the northern road out of Taverley, you will eventually reach the Heroes' Guild. The main attractions of this guild are the Fountain of Heroes, which is used to enchant a Dragonstone Amulet into an Amulet of Glory, and the basement, which contains a Coal, Mithril and Adamantite mine, and a caged Blue Dragon to train on using Ranged or Magic. Outside the guild is Achietties, who you can speak to in order to begin the Heroes' Quest, which is required to enter the Heroes' Guild.